Who wants to spend St. Pat’s with a badass Irishman? 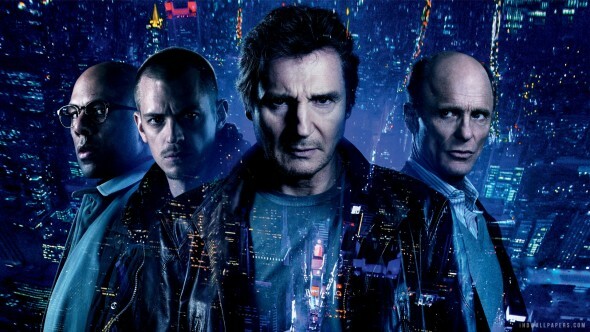 Run All Night is just your latest chance to see Liam Neeson show off his particular set of skills. An aging thug and unrepentant lush, Neeson’s Jimmy Conlon relies heavily on the good will of his best friend from the neighborhood, Shawn (Ed Harris). Shawn runs a business that used to be shady – maybe still is – but Shawn’s legitimate. Shawn’s son is strictly shady, and when Jimmy’s estranged son sees something he shouldn’t, the dads have to sort things out. With bullets. After Non-Stop and Unknown, this marks the third time director Jaume Collet-Serra has filmed Neeson as the damaged, aging loner with regrets and a bunch of people to shoot – but at this point, who hasn’t? While this film certainly doesn’t feel fresh, it’s a more accomplished movie than their last two collaborations, offering emotional pull and fine performances. Neeson’s haunted tough guy Jimmy is one of his more memorable action movie roles, even if the father/son angle telegraphs the redemption theme from up the block. Full of regret and just barely daring to hope, Jimmy’s last attempt at fatherhood is a complicated, bloody affair. Ed Harris is characteristically excellent as well, and the two veterans invest in their characters and the history they share. Because the relationship feels honest, the payoff maintains some emotional punch. The supporting cast is solid from top to bottom. From Vincent D’Onofrio’s good cop down to an uncredited Nick Nolte, they’re not flashy, but they are committed enough to their characters to keep the drama tight. Collet-Serra’s film begins as a Seventies’ style gritty NYC street drama, but as the night wears on, little glints of modern action flick start to tear through that fabric. It’s too bad, even if it is inevitable. Contrivances pile up, and wildly obviously plot twists appear only to resolve in exactly the way you expect them to. Much of Run All Night – too much, really – is familiar and predictable. It’s a credit to Collet-Serra’s pacing that the film can keep your attention, and a nod to the talent of his cast that you can feel caught up in their dysfunctional family drama regardless of the threadbare script.